Cats need their claws for many things other than for protection. Their remarkable grace and agility are due to their retractable claws. In addition, cats need their claws for walking, running, springing, climbing, stretching, and to maintain their incredible balance - even if they are always kept indoors. Unlike most mammals who walk on the soles of their paws or feet, cats are digitigrade, which means that they walk on their toes. Cats love to use their claws - it's what they do. Scratching makes them feel good. Cats use their claws to help them stretch their spine and muscles and also to mark their territory. Not only does a cat mark an object visibly by scratching it, but the scratching deposits secretions from glands in the feet that can be smelled by other cats. Scratching may also serve psychological and physiological needs by providing comfort and expression by kneading. Cats also use a form of lightly digging in the claws and giving a good stretch as a happy greeting. My Delli loves to do this on my leg. She has accepted that she can't dig the claws in as far as she would like to - as I have accepted that this is her most loving greeting for me. Cats' claws grow in layers. They are a natural growth just like hair and nails on a human. Cats scratch to remove the old flaky layer on top and reveal the smooth new claw underneath. Quite often a cat will bite and chew on the old nail until it comes off. This biting and scratching for removal of the old nail sheath is a very important part of the cats' grooming ritual. Declawing is a painful surgical procedure in which the last joint on each toe is amputated. Many people assume that declawing means removing only the nails or cutting them very short, but it actually requires removing bone and flesh and cutting tendons and nerves. In other words, it's just like amputating the lower part of each of your fingers, where the first knuckle is. You can view actual pictures of the procedure at The Pet Center . Declawing is a physically painful and psychologically damaging mutilation. Declawing may lead to a very emotionally disturbed cat who may resort to biting. This is due to personality changes that can take place after declawing. Many people have reported that their formerly lively, friendly kitty has become withdrawn. Others become nervous, fearful, and/or aggressive - often using their only remaining defense - their teeth. As if that weren't enough, the constant state of stress caused by a feeling of defenselessness may make some declawed cats more prone to disease or to inappropriate elimination outside the litterbox. It is a must that a declawed cat be confined indoors. Since claws are a cat's primary means of defense, its ability to defend itself or escape from danger has been seriously impaired. Even indoors, a cat without claws faces dangers. One physical effect of declawing is a gradual weakening of the muscles of the legs, shoulders and back. That marvelous balance that we all admire in our cats is impaired. Because a cat's surefootedness depends on its ability to grasp quickly with its claws, a declawed cat is more likely to be injured in a fall. All in all, the only thing that declawing a cat accomplishes is to keep her from leaving scratch marks on you and your furniture. It does not keep your cat from wanting to scratch things. Scratching things is a natural instinct for cats and does not go away just because the claws are gone. Tendonectomy is another horrible procedure that is being done to cats. 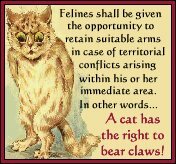 It is supposed to be more humane than declawing, but it seems to be just as cruel and barbaric to me. "It is still surprising in the 21st Century, that many otherwise intelligent and enlightened people do not comprehend what is meant by "declawing" a cat, and therefore are incapable of making an informed decision about this surgery." Franny Syufy has a terrific idea of how to make it a law to stop declawing. If you already are against declawing, Page 4 has many ideas on how you can help spread the word to make this law a reality. Clicking the graphic above will take you to Franny's article. For a list of countries where declawing is either illegal or considered to be extremely inhumane, click here. Trim your kitty's nails at least once a month. This will keep the damage to a minimum. Invest in a tall, heavy, sturdy scratching post - one that allows a full stretch and won't tip over when given a good, hefty scratching. Place it near their favorite scratching spot - probably your new sofa or favorite chair. Encourage use of the post by rubbing it with fresh catnip and praising your kitty for even looking at it! Don't reprimand for slip-ups. It doesn't work. Instead, lavish them with praise. Try the new cardboard scratching pads. My cats love them. Test various textures. Some cats prefer carpeting, some sisal. Keep a spray bottle filled with water nearby. Usually, a few squirts with that gets the message across and no harm is done to Kitty. If the spray bottle doesn't work, try using a tin can filled with pennies and shake it each time Kitty goes near your sofa. Try a spray pet repellant. Most cats hate the smell and will look elsewhere to scratch - maybe the new post you just spent the grocery money on? Try double-sided sticky tape on the most commonly gouged areas. Cats hate the sticky feel and usually will move on. Remember that your cat is not trying to be mean and onery by scratching. She is merely exercising an inherited basic instinct. You might want to try a product called Soft Paws. These are lightweight vinyl caps that you apply over a cat's own claws. They have rounded edges, so your cat's scratching doesn't damage your home and furnishings. They can be ordered on line at Soft Paws. SO IT'S TIME TO TRIM THOSE RAZOR SHARP CLAWS? Ah, the dreaded time has come - Kitty needs a manicure! Don't fret and panic - it can actually be done. Here are some tips. Probably the most important thing to do is get your kitty used to having her paws handled. This might surprise her at first. I used to get some really strange looks from Delli when I first started touching her paws. Now she thinks its great. It's much easier to start with a young kitten, so if your cat is an adult, be prepared for this to take some time. When your cat is used to having its paws handled, try cutting only one nail the first time. This may be all you're allowed to do anyway, so just expect it. Later on, try another nail, then another. Expect every session to be different. Even Sam, who is about 13 years old and whose nails I have been cutting for 11 years, still gives me some problems from time to time. Gently hold Kitty's paw in one hand. With your thumb on top of the paw and forefinger on the pad, gently squeeze your thumb and finger together. This will push the claw clear of the fur so it can easily be seen. You will notice that the inside of the claw is pink near its base. This is living tissue that you do not want to cut. Trim only the clear tip of the nail. Do not clip the area where pink tissue is visible nor the slightly opaque region that outlines the pink tissue. This will avoid cutting into areas that would be painful or bleed. The desired effect is simply to blunt the claw tip. More than likely you won't need to trim the rear claws, but keep an eye on them just to make sure they don't overgrow. Many different types of nail trimmers are available in pet stores. I have purchased a small pair of blunt scissors type, but also use my own toenail clippers. I prefer the scissors type with Delli because she resists her manicure more than the others do and I just feel safer with those. As far as I know, the other two animations used on this page are public domain. If, however, they belong to you and I have not given you credit, please notify me so I can either remove the image or link it to you. Thank you! The contents of this site are copyright© 2000-2003, Jackie Edwards/Jacqlee (The Cat Lady). All Rights Reserved.